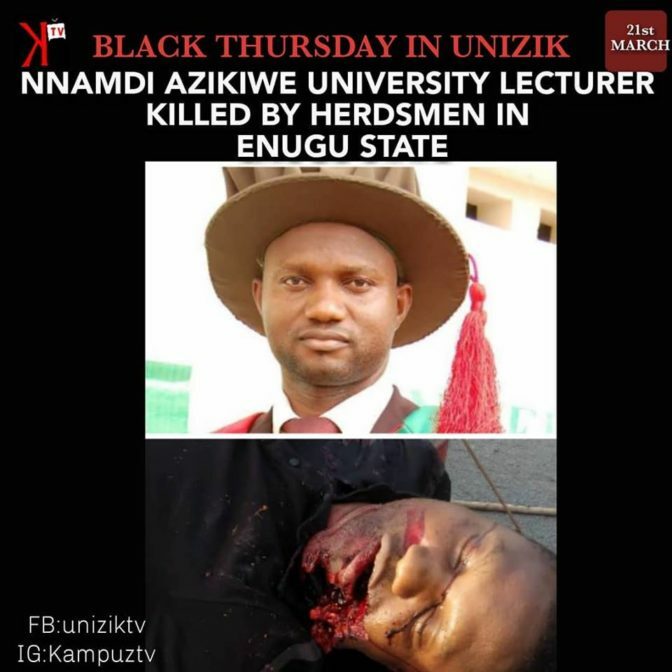 A senior lecturer at Nnamdi Azikiwe University, Awka (UNIZIK), Dr Nnamdi Ogueche has been killed by suspected Fulani herdsmen in Enugu State. It was gathered that he was killed along Ezeagu-Umulokpa Uzo-uwani road in the State. It was further gathered that the slain University don was the Administrative Secretary of Uzo- Uwani LGA, Enugu State. He was aged 40 and was married with three children, two girls and a boy. Suleiman Balarabe, the Enugu State Commissioner of Police confirmed this report while briefing journalists at the Headquarters of the State Police Command on Thursday. Balarabe described the incident as unfortunate, saying investigation was ongoing. He added that the police was yet to ascertain if Fulani herdsmen carried out the heinous killing. It could be recalled that Fulani herdsmen massacred 11 persons at Nimbo, Uzo-uwani LGA, Enugu State in May 2016. Kill all the fulanis oh God this is unbearable fulani here and there we're tired of this so called animals in human form rip Dr Nnamdi.